If you didn't know already, Eclipse allows you to define custom templates for commonly used code snippets. Its a very neat feature for those of us who are memory challenged or don't like typing things twice! 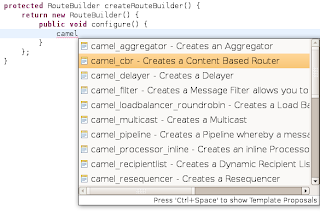 I think that Apache Camel users could really benefit from having predefined templates for doing Camel routing. I also hear a lot of requests like "I have this Java DSL route, how do I do this in the Spring XML DSL?" 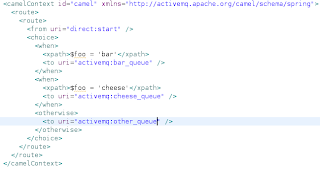 so having both Java and XML templates for the same thing is essential. 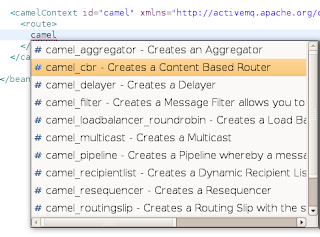 Window -> Preferences -> Web and XML -> XML Files -> Templates. Very useful indeed...Thank you !